Dressy Bessy was so cool in 1976. At around age four or five, I loved playing with my Dressy Bessy doll. Dressy Bessy and her brother Dapper Dan were soft rag dolls with a purpose ... To teach small children how to button, zip and tie. Dapper Dan was equally adorable. 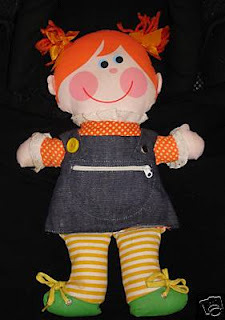 I loved Dressy Bessy's colorful clothing, bright orange yarn hair and rosy cheeks. Dapper Dan was obviously targeted to male children. 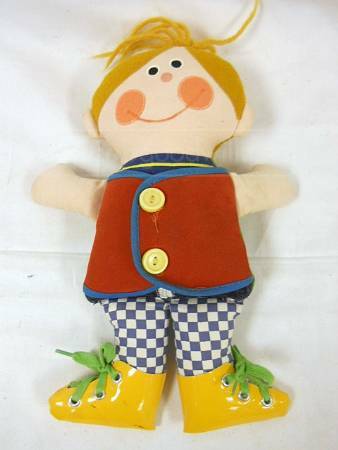 I remember playing with Dapper Dan at nursery school, but I didn't own him. He was as adorable as Dressy Bessy with his ginger hued hair, red vest, pleather yellow boots and blue and white gingham pants. These 1970s teaching toys were classic and Hasbro continued to produce the dolls updating their style. There are many imitations available, but I will always remember Dressy Bessy and Dapper Dan as the original version. I guess I was a tweener on these. I was too old and my kids were born too late.